Enough toasters for across the pond. Now for some REAL fire apparatus. 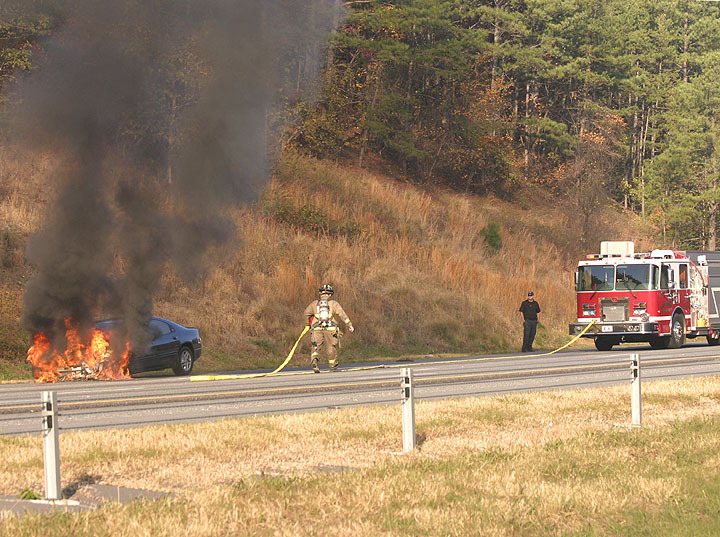 Bartow County E-6 arrives on the scene of a car fire in Interstate 75 in North Georgia, USA. They only have 1 man on E-6 so he has to do everything! Set up the pump, don his gear and SCBA, pull the attack line, go back to the pumper and charge the line... (whew!) ...and THEN fight the fire. Rural departments have minimum manpower and it unfortunately puts their safety at risk. Added by John Stott on 11 November 2008. Added by Calvin Fox on 11 November 2008. Frightening ! don't let the British government or councillors find out! Added by Rick Loudon on 11 November 2008.
staff-we don't need them, lets waste our money and get another fire truck. no wonder the injury and death toll is so very high every year in the USA. is a good idea and maybe they have other idea's as well(1man/1 engine)????. Added by Pete Matten on 11 November 2008. Added by Nick on 12 November 2008. A little more explanation. This County was mostly rural farmland 10-15 years ago. Now the Atlanta "sprawl" caught up with them. The all volunteer FD became obsolete and so 1 F/F was hired to man the station, the idea being he could get the pumper to the fire and the volunteers can show up in POVs. However, most volunteers are at work during the day and so the one lad who is manning the station is the only one to show up on the truck. It is NOT an accepted way of life, just an unfortunate political way of life. This shows how little some of the local politicians know about the modern fire service. Added by Thefireman on 12 November 2008. Our rural pumps wont turn out without a minimum of four men, three in dire straits. This is downright criminal, and for the land of "claim culture", well, unbelievable. Added by John Stott on 12 November 2008. Added by Paul Warnock on 13 November 2008. I agree Paul, they are doing first response calls and the Station Officer travels by car. We started the 3 rider rule in my last brigade and I left the retained service over it, downright dangerous. The Americans have never impressed me with their BA procedures, I remember RAF Neatishead and BA control is written in tablets of stone here thank goodness. Added by John Stott on 14 November 2008. Added by Bryan Sweeney on 02 December 2008. The real issue here is that fire protection is highly decentralized in the US, just as is almost everything else - laws, police, healthcare, education, building codes, etc. The National Fire Insurance Protection Association does set many standards and makes a lot of recommendations, but has no legal authority to enforce them. In addition, the National Fire Insurance Underwriters' Board rates every community and every fire department on a fire safety scale from 1 to 10, with 1 being the ideal. This rating does contribute to determine fire insurance rares, which provides encouragement to local governments to provide adequately, staffed, well-trained and properly equipped fire departments, but residential owners rarely inquire about local fire safety ratings. States and cities also have a variety of fire codes and practices, so that the actual needs for a given standard of fire protection vary from place to place. The result of all this is a wide range of different levels of apparatus and equipment, highly variable manning standards, a mix of training skill levels and leadership capabilities, combined with an endless variety of duty profiles - including and sometimes mixing three and four watch full time systems, day manning, paid on call staffing and volunteer rosters. The net result is that we probably have some of the best fire departments anywhere, some of the worst, and everything in between! Added by Maddog on 25 October 2018. A very busy man ! Added by Craigw on 07 November 2018. I remember once in the '90s the second-away pump at my local retained station turned out with only 3 riders. The reason being -- with only 8 firefighters on-call at the time, the first-away had turned out a couple of minutes earlier on the same call with 5 onboard. Somebody had obviously made an error. Once on-scene the fifth occupant of the water ladder joined the water tender crew! Added by Yelp Bullhorn on 09 November 2018. Most of Germany's 23,000 (not a misprint!) volunteer fire companies send 16 people to a structure fire, which is actually a legal requirement. This usually involves two pumps with nine members on each, plus a turntable ladder in most cases with another two. As the fire stations are close together, the first attendance very often comes from the nearest two stations. Because it takes time to get nine volunteers into a pump, many companies are buying six seater pumps, with the rest of the first due crew riding a minivan to "top up" the attendance. Added by Rob Johnson on 15 November 2018. I wonder does 'top up' with later arrivals happen in the UK , many of the retained stations in NE have one pump plus a 4wd pick up. Added by Craigw on 16 November 2018.